The people and cyborgs of the Scrapyard live beneath the floating city of Tiphares, whose inhabitants dump their junk in the Scrapyard and rule above its inhabitants. One day Ido, a former Tipharean citizen and doctor specializing in cyborg repairs, finds the intact head of young cyborg-girl in a vast pile of scrap. He takes her in, gives her a body and the name Alita. 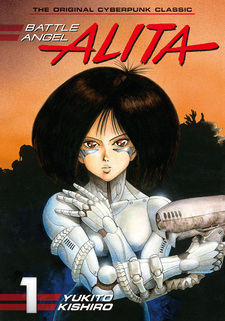 Alita then discovers long forgotten fighting techniques hidden in her body and decides to become a hunter-warrior; a bounty collector employed by the factories of Tiphares. 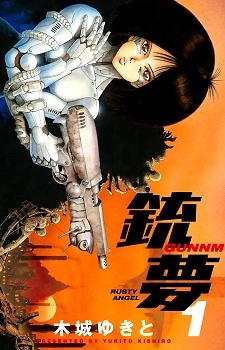 Gunnm was first published in English as Battle Angel Alita by VIZ Media in comic book format, with 68 VIZ Select Comics issues split into 8 parts from July 1992 to March 1998. It was republished under the VIZ Graphic Novels imprint from July 6, 1995 to December 6, 1998, and again under the VIZ Action imprint from December 31, 2003 to March 1, 2005. Kodansha Comics took over the license and has been releasing the series digitally, and physically in hardcover deluxe editions since November 21, 2017. The series was also published in Brazilian Portuguese by Jbc from May 2003 to November 2014, as well as in a number of other languages, including French, German, Finnish, Spanish, Italian, Dutch and Polish. Oscar winning director James Cameron was introduced to Gunnm by fellow director Guillermo del Toro, and subsequently purchased the rights to a film adaptation in 2000. Production was halted numerous times due to Cameron's commitment to other projects, until October 2015, when Cameron handed over the director position to Robert Rodriguez. I've seen Battle Angel Alita around for some time, but because I always thought it seemed like some cheesy old shounen series, I never bothered trying it. However, during a period of boredom I suddenly came across it and decided to give it a try. And I was very surprised. The story starts out like a typical shounen series, with an amnesiac cyborg girl being found in a scrapyard. She is then repaired by the guy who finds her, who becomes a kind of father for her. continuing on, she meets lots of people, friends and foes, while pursuing bounties in a dark, steampunk styled post apocalyptic world, all the while wondering about her missing memories and the nature of her &quot;Panzerkunst&quot; abilities. From here, the story takes many very unexpected twists, and Alita herself undergoes extensive personal growth. The further the story goes, the less predictable it becomes, leaving you craving for the next chapter, showing all sorts of themes, psychological and philosophical, with the occasional comical relief. The only thing that saps the story's rating would in my opinion be the rushed and somewhat silly ending (Although this is remedied in the sequel, Battle Angel Alita: Last Order), leaving the story's score at 8/10. As with many other mangas, the art gets progressively better throughout the series, but is at all times extremely detailed and delivers a great portrayal of emotion- at least, for the characters that still have their human faces intact. Another selling point would be the great number of exotic looking cyborgs, who are all deeply detailed and more or less originally designed. The characters are what really made me love the series, as almost every character, including even the small fry antagonists from the early volumes, have their own interesting stories, and after learning of their background, you get to see why they act as they do, and you see how they change throughout the story. The most interesting character is, naturally, Alita herself, who change dramatically through the manga. She starts out as an innocent girl with a carefree and optimistic view on everything, and then goes through different phases, experiencing friendship, love, sorrow, hate and eventually realizing the burden that comes with her power. I also found it refreshing to see a main character who does not hesitate to massacre her enemies. There's far too many of those already. Without a doubt, the brilliant cast of characters and their deep stories and personalities provide this manga with a top score in this category, 10/10. For the overall enjoyment, I believe what I have written above speaks for itself. Some things that I find noteworthy however, is the fact that I never found any of the often lengthy battles to be boring. While many other action packed series leave me hastily breezing through dull and exaggerated battles performed by pretentious combatants, I actually read BAA's battle scenes panel by panel. Despite a somewhat rushed ,and in my opinion, disappointing ending, this manga is still a brilliant read, mostly thanks to the mechanized angel herself and all the other lovable and despicable characters, and receives from me a whopping score of 10/10. What a great original story this was. The art is very detailed and clear in the sense that you can actually understand whats going on in the fight scenes. For some fighting manga's it was very difficult to imagine what went on during a fight scene but Alita didnt lose me. I got a sense of excitment following Alita's develpment from innocent cyborg to bounty hunter to elite sportwomen to warrior as there was not a single boring moment. It was a thrill to see what new weapons or body she would get and how she would defeat or catch her enemies. Not only was the main characters interesting in that each one of them was unique but it was interesting to see what the author thought about what the future world between cyborgs and humans would be like. Plenty of blood, gore and fan service and a love story as well. Something to appeal to everyone i think. I found the story to be dark yet beautiful at the same time. When most people think of futuristic sci-fi settings involving cyborgs in anime and manga, the first thing that’s likely to come to their heads is Ghost in the Shell. While the GitS IP is a very accomplished and influential one, it greatly overshadowed another similar but in my opinion superior work. Battle Angel Alita(which goes by the vastly inferior title Gunnm in Japan) was released in 1989 and despite being an excellent manga, it never became particularly successful and only a small portion of it managed to get adapted into an anime. The story of Battle Angel Alita begins in a scrapyard where a scientist named Ido discovers the remains of a cyborg girl. She has lost all her memory and has no identity. He names her Alita, gives her a cyborg body and a reason to live. The setting is based around a floating city called Tiphares. Most of the action is set outside of the city and on what’s deemed ‘the surface’ where people live off the scraps of the city, but events do eventually lead to the city itself. The artwork starts off as merely serviceable but gradually improves and becomes excellent late. It really brings the world to life. The style invokes a Blade Runner esque feel and manages to be very immersive. The action scenes are also excellently drawn. You can always make out what’s going on clearly and the panels segue into each other in a satisfying way. What really makes BAA shine however is not its setting or artwork but its characters, or more specifically its main character, Alita(or Gally in Japan). She is easily one of the greatest characters in the medium. She is deep and complex and her character arc is extremely well handled. We see her go from an innocent ‘child’, to an aggressive bounty hunter and racer, to a love struck and contemplative individual, to badass anti-hero, assassin and eventually outright hero. This is all believably handled and very well executed. While Alita no doubt steals the show, there are plenty of other high quality characters too. Most note-worthy is probably Ido, the scientist who took in Alita as his own and made her what she is. His relationship with Alita is quite deep and complex. He mostly sees her as a daughter and wants her to himself, though there is likely sexual undertones to it as well. He looks after Alita as best he can but tries to keep her as close to him as he can, to the point where he will intervene with her actions if she strays. The villains are also a very fascinating bunch. Very few of them are portrayed as being outright evil. Even some that initially seem to have no redeeming traits end up being somewhat likeable in the end. They all have their reasons for doing what they are doing and never feel like they are just shoved in to give the protagonist something to fight. A mad scientist does feature but even that trope is averted somewhat. The way they play off of Alita’s personality while she interacts and fights them is very compelling to witness. The story encompasses a very wide range of themes. It’s based around technology, ethics and philosophy. It’s very contemplative without ever getting bogged down with long winded exposition. The pacing for the whole manga is in fact pitch perfect. Each volume is about something different to the last, both in terms of theme and events. While the old chestnut Amnesia is used to start the story, things change very rapidly to a journey of self discovery, the meaning of life and the follies of man. Rage, sadness, jealousy, compassion, love and hate are all emotions present. Events change from Bounty hunting, to rollerball, martial arts combat, wartime battlefields and more. Despite the change in tone, everything feels cohesive and well planned out. There is barely a single panel of filler throughout. There are also very few plot holes or inconsistencies throughout. There are a few revelatory plot twists that get introduced. They manage to both shocking yet in no way undermine the narrative that preceded it, like can often be the case with stories that rely on shock value. Very few manga or stories in general manage to be so well paced and entertaining, while also being deep and contemplative, but BAA succeeds spectacularly. There are only a minor few gripes I had with the story. While I had no problem with the open ended nature of the ending, the build up to the ending did feel a tad rushed. Some events happened a little too quickly and weren’t explained in as much detail I would have liked. There is a follow up to the manga entitled The Last Order which does explain some of these things but that takes it a step too far and just ends up but a bloated mess, which is probably best avoided. The only other flaw of any genuine worth I recall involves Alita’s relationship with a character called figure 4, who appears later. This character is not very likable yet Alita falls somewhat in love with him rather quickly. I didn’t find this particularly believable.Considering the type of character she was and the fact that he was somewhat of an idiot sapped credibility from the proceedings somewhat. This is fortunately only a small part of the story and doesn’t impede much on events overall. Battle Angel Alita is perhaps the best sci fi manga I’ve read and one of the greatest sci fi stories in general that I’ve experienced. Despite its lack of popularity, its influence can be seen in works to this day such as the films Elysium and TV show Dark Angel. Regardless of that, the story is simply an excellent tale in its own right and deserves much more recognition than it has. Nowadays, I seem to find that stories revolving around the nature of heroism, especially within anime, are rather stale. Stories about heroes, or what makes a hero a hero, are filled with protagonists who seem to be invincible, or rather, superficial in the sense that they contain no actual realism towards what makes them a hero. If you take your time to look closely and observe, you’ll find that conflicts within a majority of modern day stories are resolved with simple words of wisdom, or “power-ups” to defeat an obstacle blocking the hero from victory. This causes the heroes that we’re supposed to praise and care for to become uninteresting, cardboard characters that we can’t sympathize with, no matter how hard we try. However, if you look into the past, specifically within anime and manga, you will find that a plethora of stories centered on heroism are not only gripping, but they also contain heroes that are believable, flawed, and most of all, unique. One such story is that of Battle Angel Alita, a manga that perfectly grasps the nature of what heroism is, as well as the cost that comes with being a hero. Within the category of sci-fi action stories, Battle Angel Alita is one of the very best. Written and illustrated by Yukito Kishiro, the story’s setting is the rundown and harsh, desert-like city known as The Scrapyard. This cesspool of a city contains the worst criminals that humanity has to offer, along with cybernetic freaks terrorizing citizens. The protagonist Alita is introduced to us by a caring doctor/engineer named Ido, who finds her body in a local dump within The Scrapyard. After getting her cybernetic body put back together by Ido, Alita almost immediately experiences the horrors of The Scrapyard’s criminal activity and decides to make it her mission to become a Hunter Warrior, a bounty hunter of sorts that acts as a police force within The Scrapyard. As Alita begins her journey to help the innocent people of The Scrapyard, she soon starts to realize that the job of a hero is filled with both tragedy and self-revelation. What makes this manga have such an exceptionally well-written story is Alita herself. I don’t mean to exaggerate when I say that she is honestly one of the greatest fictional characters ever created within anime and manga. What makes her character so great is the fact that Yukito Kushiro wrote her to be a sort of “symbol” or representation of what it means to be human and the experiences that human beings go through in life (which is a bit ironic considering the fact that Alita herself is not fully human). Throughout the story, we follow Alita through many locales of an apocalypse filled with despair and fear for survival. And although she witnesses many horrifying events and experiences pain, both physically and emotionally, Alita keeps her image as a messiah among those who are weak and need salvation. Alita contains a sort of charm or spirit of a hero that rises up against evil. Something that also makes Alita such a great character in the story is the element of her backstory and how she suffers from amnesia. Although Alita is constantly viewed as a girl with an immense amount of courage and willpower, she still contains one major weakness throughout the story, which is her past, which is a puzzle that she constantly tries to solve. Because of this obstacle of hers, many moments of the manga brilliantly portray Alita as a damaged and ultimately flawed individual. Her flawed behavior and individuality causes many undesirable outcomes to befall on the other characters of the story. When these events happen, we witness some of the manga’s very best writing, as it shows that Alita must learn from her mistakes and flaws in order to keep the ones that she loves close to her heart. Not only is Alita a great character, but so are the many people that she comes across throughout the story, especially the villains she encounters. What makes these supporting characters so great is the fact, like Alita, they all contain some sort of aspect or characteristic that makes them feel human. Almost all of the characters within the story have regrets about their pasts, existential feelings of nihilism, love, and thoughts about their own meaning for existence. This allows the reader to not only connect with Alita, but the many others that she meets throughout her adventures, both good and bad. Sadly, there are some characters that are often forgetful throughout the story and stereotypical. However, that is only a minor flaw considering how many other great characters like Alita there are in the story. Aside from the excellent writing, Battle Angel Alita also has some of the very best artwork that you can find in manga. Kushiro does a brilliant job of conveying the action that we see in the panels as very gritty, dirty, and emotionally resonate with the characters that are fighting one another. The artwork also allows for you to witness the action on an “epic” scale because of the sheer amount of destruction and chaos from environments that are illustrated. What I also found great about the artwork are the breathtaking illustrations of Alita and other characters’ facial expressions and movements, making you think as though the characters were truly real. Everything from technology, body language and postures, expressions, and action are drawn with superb technique from Kushiro. Battle Angel Alita is a manga that deserves to be read by science fiction, action and drama fans alike. This manga contains some of the best character writing that you will ever find in a manga or any story for that matter. The artwork is outstanding and Yukito Kushiro does an awesome job at portraying the humanity of Alita and other characters. Alita herself is also the perfect representation of how a hero should be written in an action story. Reading this manga will make you feel as though you’ve seen one of the most exciting and explosive action films of all time, only that this is a manga. Battle Angel Alita is a must read for anyone looking for an exceptionally atmospheric action manga, with a protagonist that is not only badass, but is also realistically relatable.